Two circa 1880 business cards of J. 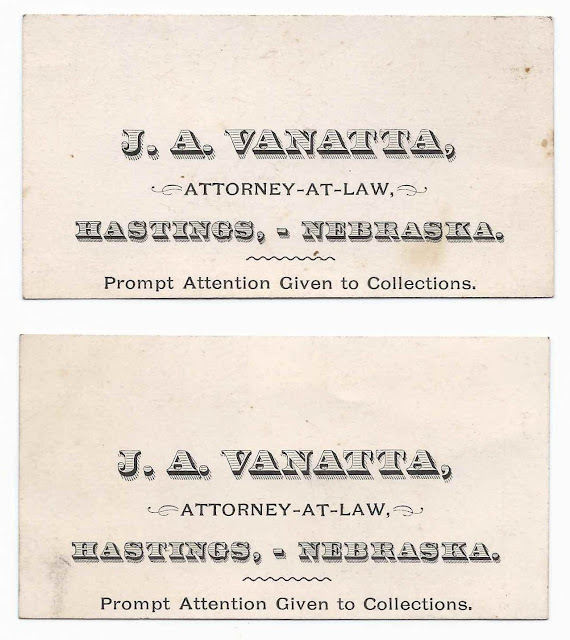 A. Vanatta, Attorney-at-Law, Hastings, Nebraska. 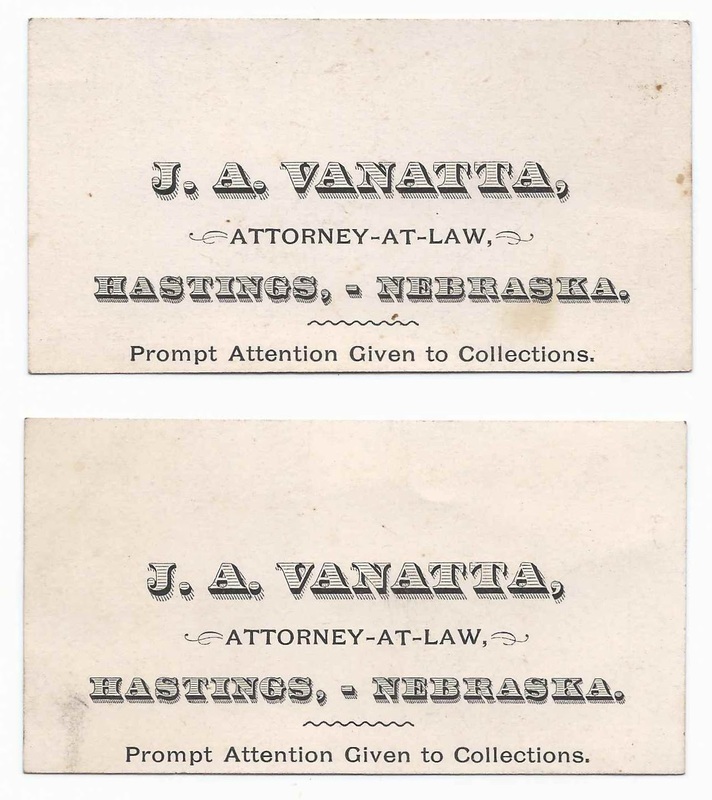 He was presumably the Joseph A. Vanatta mentioned in the "Biographical and Historical Memoirs of Adams, Clay, Webster and Nuckolls Counties, Nebraska", published in 1890, as an Iowa native admitted to the Nebraska Bar about 1878. The 1880 Census of Hastings, Nebraska, lists a lawyer named J. A. Vanatta and wife M. H. Vanatta. J. A. Vanatta was born about 1854 in Iowa; his parents were shown as Pennsylvania natives. This fits with Joseph A. Vanatta, whose parents were Thomas and Martha (Shearer) Vanatta of Pennsylvania, who moved from Beaver County, Pennsylvania, to Muscatine, Iowa, and then to Newton, Iowa. Wife M. H. Vanatta from the 1880 Census of Hastings, Nebraska, was Margaret Hannah (McElroy) Vanatta, "Maggie", born about 1857 in Ohio, daughter of Hugh McElroy, an Ohio native. Joseph and Maggie had a daughter Maud, born about September 1880. Sadly, Joseph died in 1885; he's buried at Wittemberg Cemetery at Newton, Iowa. And, sadly Maud, too, died fairly young, in 1908 and is also buried at the Wittemberg Cemetery. 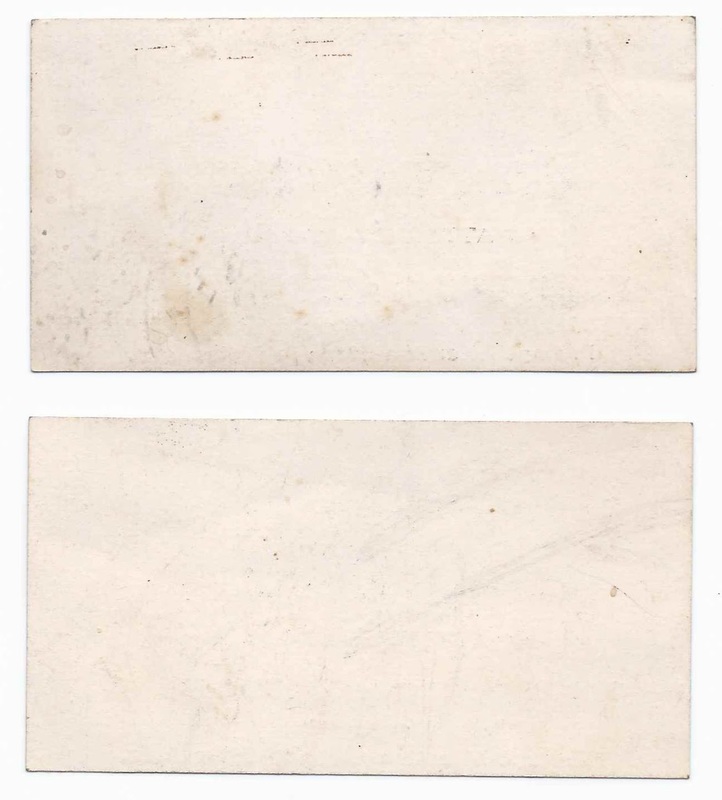 If you have corrections to the information above, or feel that the business card card referred to another J. A. Vanatta, please leave a comment or contact me directly. Thanks! are the above cards still available?